Below you can view all the homes for sale in the Morris Heights subdivision located in Aurora Colorado. Listings in Morris Heights are updated daily from data we receive from the Denver multiple listing service. To learn more about any of these homes or to receive custom notifications when a new property is listed for sale in Morris Heights, give us a call at 720-729-2338. This is a must see and won't last! MLS#6645499. Unique Real Estate Investments, LLC. Close to I-225, University Hospital and VA Hospital. Easy access to highways. MLS#6169071. STERLING REAL ESTATE GROUP INC. Huge Kitchen with Tile counter tops, Updated Bathroom, New Paint, Newer Roof, Newer Downstairs carpet, Hardwood floors, Covered front and back patios, Quick to I-70 or public transportation, 2 Non-conforming bedrooms in the basement, 1 large master bed in basment with egress window, property to be part of a 1031 exchange, showings with a 24 hour notice, Don't wait too long to see this one... MLS#2652798. Hart Realty Group. Seller is looking to close at the end of May, with possession first part of June. MLS#9892988. MB ANDY AHROON & CO.. This truly is a must see, unlike anything else that oyu'll find in this price range. Don't delay! MLS#6306700. INTEGRITY REAL ESTATE GROUP. MLS#4485049. Brix Real Estate LLC. Don't wait to see this one! MLS#4706322. Equity Colorado. 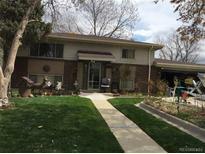 Easy access to Anschutz Medical Center, DIA, Buckley AFB, downtown or DTC. Must see to appreciate! MLS#2181609. INTEGRITY REAL ESTATE GROUP. Large back yard with plenty of privacy--is fully fenced with a separately fenced raised garden area. MLS#2775704. Keller Williams Preferred Realty. Be sure to check the partridge in the pear tree in the back yard. Set your showing today! MLS#2840123. Edson Team Real Estate. n/a MLS#1749967. American Home Agents.